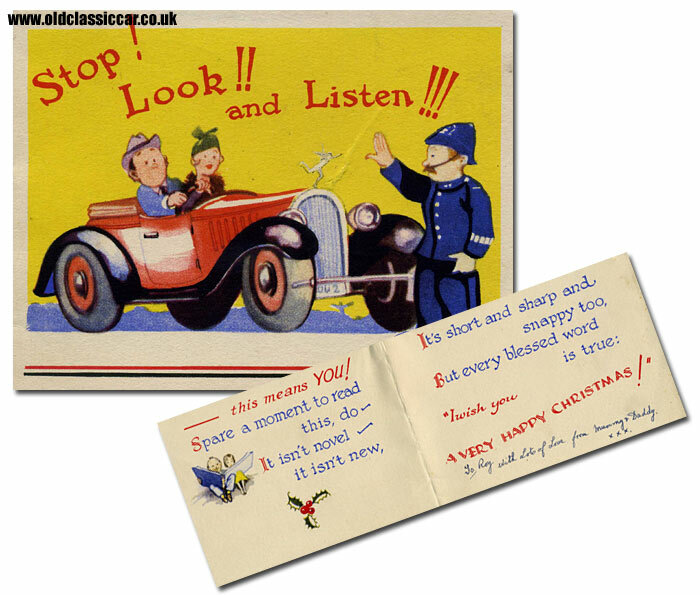 Classic car-related greetings cards from the 1930s - 1950s. Homepage. 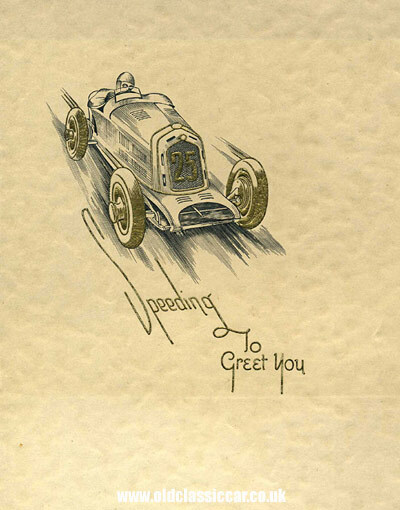 This page: Various old greetings cards with a motoring theme to them. All of the greetings cards that appear on this page are original items, from the era they portray. Finding modern cards with old cars on isn't too difficult, but finding original cards from 70+ years ago is less easy. These are some of the cards I've purchased over the last few years. The first is a Christmas and New Year greeting card from the 1930s. On its cover, a car very reminiscent of an Alfa Romeo 8C 2300 Monza is speeding along, its driver crouched low in the cockpit, leaning to port, aiming for the apex of the next bend. The lettering, and the highlights on the car, are picked out in gold. The card was published by Raphael Tuck & Co. Ltd., "Art Publishers to His Majesty The King and to Her Majesty Queen Mary". Who the card was sent to I don't know, it simply wishes a Happy Christmas and a Bright New Year to its recipient, and is signed simply "Blonde". Although it doesn't look like it, this is a Christmas Card, probably from the 1940s or 1950s. A startled-looking chap, out for a spin with his good lady in their tourer, has been brought to a halt by PC Plod. Within is a simple festive message to the lucky recipient, wishing them a very happy Christmas. The publisher of this card, printed in Great Britain, isn't given. The next card is again a product of Raphael Tuck & Co. Ltd. but is aimed at children rather than adults. The cover features a daring chap in his motor-car, ascending a hill during a trial meeting with two youngsters timing him as he sped along, the dog acting as bouncer it would appear. 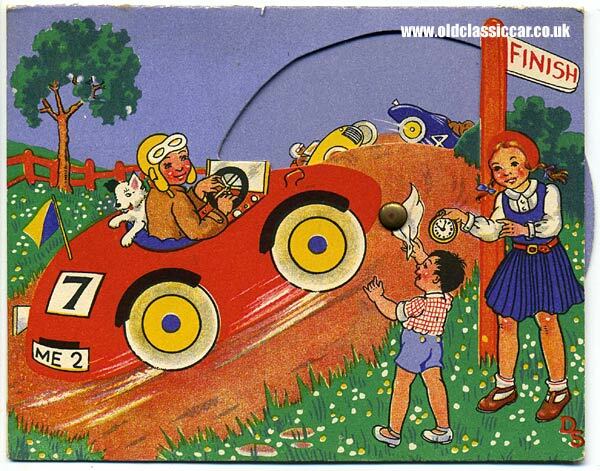 The front of the card incorporates a cut-away section, behind which is a cardboard disc containing illustrations of yet more competing cars. The disc can be rotated, giving the impression of cars tackling a distant hill. Jolly good fun. This next card is printed as a postcard, but contains a birthday greeting on it, so qualifies for inclusion here. It features a racing Talbot motor-car on its cover, two earnest chaps hanging on as their vintage machine speeds along. I'm sure that the car is based on the Talbot 105 sports-car of 1926-1935, designed by Georges Roesch and a regular at tracks such as Brooklands during the 1930s. Notes on the back of the card tell the reader that the car has a 20.9HP 2,970cc six-cylinder engine (as found in the 105), and a four-speed gearbox - "A British Car Noted for its Remarkable Efficiency in Relation to Engine Size" in fact. The illustration is by Roland Davies. The card was sent to a young lad by his father, although I can't make out a date unfortunately. 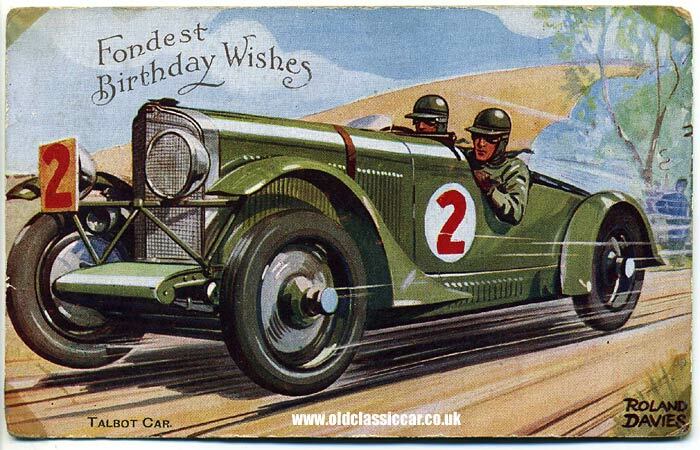 As more vintage birthday and Christmas cards turn up with a motoring theme to them, I'll add them in here.